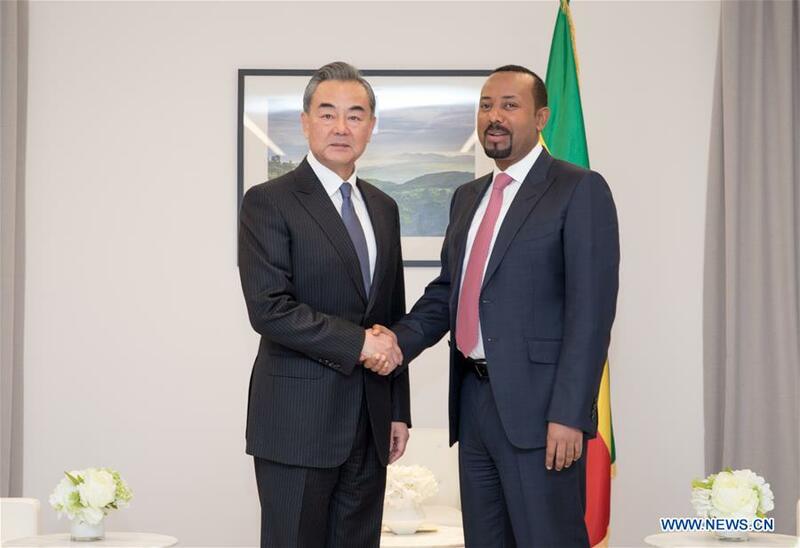 ADDIS ABABA, Jan. 3 (Xinhua) -- Ethiopia's Prime Minister Abiy Ahmed on Thursday met with Chinese State Councilor and Foreign Minister Wang Yi in Addis Ababa, capital of the East African country. Abiy requested Wang to convey his cordial greetings to Chinese President Xi Jinping and Premier Li Keqiang. The visit by the Chinese Foreign Minister to Ethiopia just at the beginning of the New Year bears testimony to the point that China is a true friend of Ethiopian and African people, said the Ethiopia's Prime Minister. He stressed that China has made positive contributions to the development of Ethiopia and other African countries. He said Chinese companies have carried out most of Ethiopia's infrastructure projects, creating tens of thousands of jobs for local people and solidly promoting the country's economic and social development. Appreciating China's long-term vision and strategic thinking in planning national development, the Ethiopian Prime Minister expressed the hope that his country can strengthen exchanges and experience sharing with China. He hoped the two countries will deepen overall friendly cooperation in a mutually beneficial manner in various fields and further promote bilateral trade and investment cooperation. Abiy said he also hoped the two countries can carry out cooperation on technological innovation that is related to the future development of the world. Stating that Ethiopia firmly adheres to the one-China policy and actively supports the Belt and Road Initiative, he said he is happy and ready to attend the second Belt and Road Forum for International cooperation. Wang on his part conveyed the greetings of the Chinese leaders to the Ethiopia's Prime Minister. He said that China and Ethiopia are close friends and strategic partners. The friendship has withstood the tests of fluctuating international situations and is unbreakable. China supports Ethiopia to pursue a development path that suits its national conditions and wins the support of its people, Wang said. Wang said he believed that under the leadership of the Prime Minister, Ethiopia will certainly overcome the temporary difficulties and successfully move towards industrialization and modernization. In this process, China will firmly remain the most reliable and long-lasting partner of Ethiopia, and strive to provide assistance and support to Ethiopia's development, said Wang. Wang stressed that Ethiopia is one of China's important partners in jointly building the Belt and Road on the African continent. He said he believed that strengthening the bilateral cooperation on the Belt and Road will not only open up new prospects for China-Ethiopia relations, but also promote China-Africa cooperation under the framework of the Belt and Road Initiative. He further expressed the hope that both sides can work together to facilitate the aligning of the outcome of the Beijing Summit of the Forum on China-Africa Cooperation with the cooperation plans of both sides, so as to take the bilateral relations to a new level under a new situation.